During outages – please call 360.376.3500 to report an outage or check www.opalco.com/outages for the latest information on outages. Sign up on SmartHub for text or email outage alerts. OPALCO continues to improve the reliability of the system. Still, there are circumstances beyond our control such as weather, car accidents, equipment failure and bird or animal events that can cause outages. 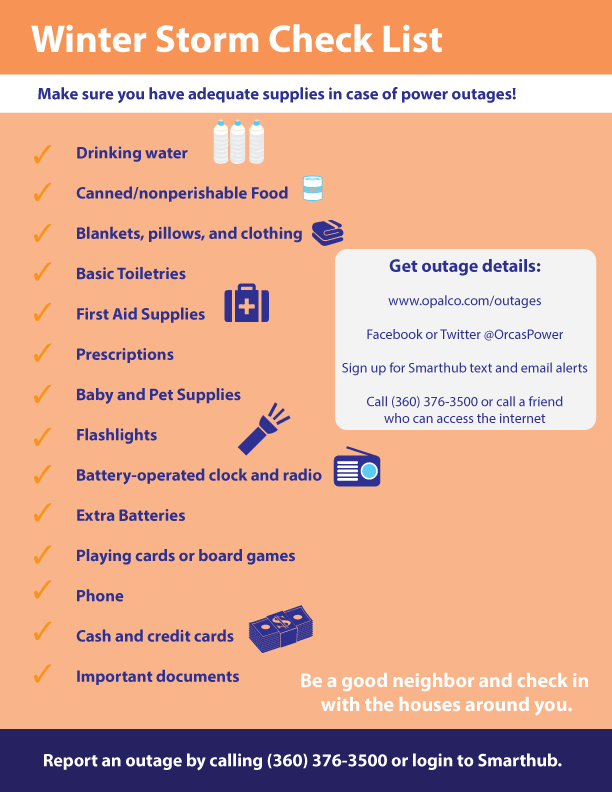 When scheduled outages are necessary, OPALCO calls members in the area to be affected in advance. During unplanned outages, OPALCO updates its phone message and online outage portal as best we can. To adequately prepare for outages a little bit of planning ahead can go a long way. Make sure you install surge protection for your electronic, computer and other sensitive equipment. Know where to find your utility shut off (electricity, water, propane) and how to turn them off. If you have an electric garage door opener, make sure you know how to open it without electricity. It’s a good idea to have an outage/emergency preparedness box. See the checklist below. If you suspect an outage is coming, make sure you have your phone charged up, fill up your gas tank in your car, and if you have an electric well pump turn off pump breaker and plan ahead for your water needs. Because the most detailed information, photos and updates on outages are posted on Facebook, Twitter and on OPALCO’s website, we encourage people who don’t have a smart phone to find an “outage buddy” who does, so they can share information and check up on each other. An excellent resource for emergency preparedness is the San Juan County Department of Emergency Management. Check out their resources for being prepared. To report a power outage, call (360) 376-3500 for any island. Outage calls after hours are answered by the Dispatch Center and OPALCO crews are alerted. You can also login to SmartHub to report an outage.